About this object An 1820 seating chart from The Analectic Magazine provides a map to the House Chamber filled with Constantine Desks. Missouri statehood continued to monopolize the energies of the 16th Congress (1819–1821). The first session hammered out the Missouri Compromise that admitted Missouri as a slave state, Maine as a free state, and codified Missouri’s southern boundary as the designating line between free and slave territories. In the second session, Henry Clay of Kentucky put the final touches on the Missouri Compromise after he convinced the territory’s officials to remove an offending clause in Missouri’s constitution which would have excluded all African Americans—whether slave or free—from residing in the state. 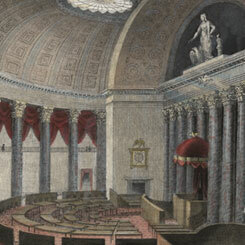 On this date, the first known funeral in the House Chamber occurred. 1Resigned on October 28, 1820.